NESTA keep setting them up and we keep falling for them. 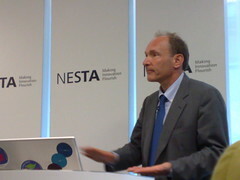 This evening Tim Berners-Lee, y’know, clever chappy – invented this web thing that I’m using to write to you, got the Order of Merit no less, was speaking on the Future of the Web and in particular his Web Science Research Initiative – trying to get us to understand the web as it is and where it’s going in order to help make it better. arbitrary precedence given to people on twitter over people actually in the room. I have questions, but more than three. This makes me rather glad I didn’t make it in the end… I’d been expecting to hear TimBL expand on the ideas he’d not been given space for at Innovation Edge and had no idea it was going to be a panel discussion. Surprised we didn’t see you as the main room as it was pretty tiny, but from your photo looks like you were the other side. Never been to NESTA before. I had expected a huge lecture-theatre setup given the obvious demand for places and obviously expected to hear just Tim and not a panel. Still, glad I went. Loved the gunk in the plughole analogy. Lots of goosebumpy hairs-standing-on-end moments! We live in exciting times. Not sure I’ll bother to go to any other events there though, especially if they will be webcasted. For what it’s worth, there was no audio on the first thirty minutes or so of the webcast (sounded like something not plugged in right). So being there in person had its benefits. However, as others have observed, the way to get questions asked was via Twitter. ooooh sounds messy. liking the rage Lloyd. more please.